Since 1996 ITS Africa has been on the forefront of service excellence of the industrial, home and garden cleaning industry. Our hands on management team brings over 36 years of experience in the cleaning equipment industry to the table, offering our clients expertise and professional advice that only comes with experience. Since our inception in the mid-1990s ITS Africa has grown from three staff members to more than 50 full time staffs, based in sales and service offices throughout South Africa including Cape Town, Johannesburg, George and Port Elizabeth. All of our staff members are also factory trained to ensure that only the best workmanship is provided. One of our most popular products includes the Kärcher stop-on cleaning units that we make available for our professional consumers. This innovative step-on technology combines both the manoeuvrability of a walk-behind unit combined with the speed of a ride-on. We make available several leading Kärcher step-on cleaning units that will help you to meet the demands of your industry. The first unit is the Scrubber Drier BD 50/40 RS BP. This step-on scrubber drier offers 51cm working width and 40lt tank capacity. Its standard accessories include a disc brush, curved suction bar, traction drive, automatic water stop and parking brake, as well as a two-tank system. The Kärcher Step-on Scrubber Drier BR 55/40 RS BP is an extremely compact and high pressure scrubber drier that offers incredible manoeuvrability of a walk-behind scrubber with the speed of a ride-on machine. Offering a small turning circle of about 120cm, it is a breeze to use in even awkwardly shaped rooms. It also has a raised operating position for clear view. Its efficient roller system makes for excellent scrubbing performance and cleaning in small crevices. Using this technology will help you to easily remove stubborn dirt on structured surfaces. Thanks to the integrated sweeping attachment manual sweeping is not necessary. The BDP 50/2000 RS BP Ultra High Speed Step-on Polisher features an advanced integrated vacuum system. Polishing dust is collected under the pad and then passed upwards into the filter bag. You can easily access and change the filter bag, making operation even more expedient and convenient. The unit features a traction drive, battery and charger and drive board with centre lock. At ITS Africa we have always been committed to making available our cutting edge technologies at the most affordable and competitive rates available on the market. We are able to do this thanks to our large industry presence and our greater buying power. This allows us to transfer the savings directly to our customers by way of making available affordable and cost-effective Kärcher step-on cleaning units. Our products enjoy leading industry status and warrantees, which only offers our valued clients even more reason to shop with ITS Africa. Our specialist sales team encompasses 14 sales professionals who are experienced and competent in the cleaning industry. Thanks to the specialist training in technical application technology by our European suppliers, our sales staff are able to identify your company’s needs and offer an industry leading solution to all your cleaning needs. The ITS Africa sales team draws on our national technical resources where even the most technically complex cleaning applications can be resolved. We have always been passionate about only bringing our clients the very best quality products available on the market. Investing in units from ITS Africa will help you to meet the demands of your business and industry. If you would like to learn more about our extensive range of Kärcher step-on cleaning units, contact ITS Africa today. The invention of high pressure washers by Alfred Kärcher in 1950 revolutionised the way in which we approach industrial cleaning and there has even been some valuable spin off that has helped to simplify the lives of domestic users too. Evidence of the power of water is all around us. The Grand Canyon, for instance, is the result of erosion by millions of years of contact with a fast-flowing torrent. Nearer home, the world-famed Victoria Falls are retreating steadily northwards – again the result of erosion by water. Under sufficient compression and directed into a fine jet, water is able to cut through stone almost effortlessly. The same principle is widely applied, although at far lower pressures, in these powerful and highly efficient modern cleaning machines. Typically, a unit will consist of a water storage tank that doubles as a compression chamber. The actual compression is provided by a motor which may be powered by a battery or some version of the internal combustion engine. Once the required pressure has been reached, the water may be directed onto the surface to be cleaned using a narrow-bore, hand-held tube, known in the trade as a wand. The pressurised water is released by activating a trigger. Interchangeable nozzles provide a narrow or wide jet depending on the surface or item that needs attention. The jet dislodges any mud, dust or grit from all surfaces even with a cold water machine. However, where the dirt is more stubborn, some units are equipped with a heater for extra cleaning power. On very greasy or oily surfaces, the heat alone may still not always suffice. For these situations, specific detergents or solvents may be added to the water to improve its grease-cutting properties and some models are fitted with the means to feed these agents directly into the stream as and if required. Compressed water is a highly effective tool that saves many hours when compared with conventional cleaning methods. ITS Africa can advise you on all industrial and domestic cleaning tools, and supply industry-leading high pressure washers. The use of hot water high pressure cleaners has grown steadily since the concept of using high pressure water jets to clean soiled surfaces gained commercial viability in 1950. Today units similar to this have found widespread applications in both commercial and industrial fields and Kärcher, the pioneers of this innovative cleaning technology, remains the industry leader having developed a wide range of these machines and other cleaning equipment that together offer a range of powerful solutions to address any imaginable cleaning task from commercial car washing to valeting Jumbo Jets. While cold water models also have their uses, the use of hot water is particularly effective for the really dirty jobs and, where a surface may be soiled with oil or grease, models that permit the user to introduce a suitable detergent into the jet are also available. To a large extent, it is the area to be cleaned that is likely to prove most important to identify the precise model needed to tackle a given task. For localised cleaning jobs there is not likely to be a great deal of need to move the unit very far so a static model is quite likely to be adequate and will involve a smaller outlay. As soon as the soiled area becomes fairly large, as in the case of a warehouse floor or outdoor parking area for instance, it may prove far more practical to purchase a mobile unit. It will save time and result in far less operator fatigue. Powered by mains electricity, battery or petrol for outside use, these units also provide the larger water capacity required to reduce the constant need for refilling. They come in a range of capacities to match the size of the job. 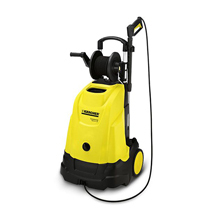 Static or mobile, petrol or electric, of large capacity or relatively small, designed to operate at modest or superheated temperatures, there are hot water high pressure cleaners suited to almost any commercial or industrial cleaning task.